CanFin Homes Ltd Has Recently Published The Job Notification For The Post Of Junior Officers vacancy.Total Posts 50 Starting dates of online apply 19-09-2018,Those candidates who are interested in Can Fin Homes Ltd Junior Officers vacancy they can read notification carefully & apply online before last date of apply online apply 29-09-2018. Degree (Graduation) in from a recognized University. 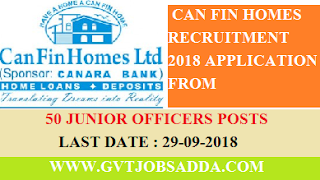 For more detailed information about Educational Qualification & Age limit in Can Fin Homes Ltd Recruitment candidate can check the Official Notification.